When you showcase their darker and less innocent aspects, flowers can become so thrilling and beautiful, they could almost ruin you. That was the sensation I was after. 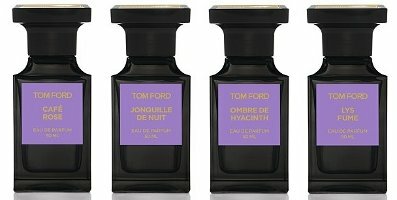 Tom Ford Café Rose, Jonquille de Nuit, Ombre de Hyacinth and Lys Fume are available in 50 ($205) or 250 ($495) ml Eau de Parfum, and can be found now at Saks Fifth Avenue. Update: the notes for each fragrance, listed above in brackets, are via moodiereport. Another update: see a review of Jonquille de Nuit. I will never tempt myself with even a decant, as these are out of my price range, and it’s pointless to covet something I cannot/will not have. Is there an article anywhere on the profits made on perfume? Deluxe: How Luxury Lost Its Luster is a great place to start! Also, Bois de Jasmin did a great article this year on luxury pricing in perfume, so sorry but can’t remember the exact name. Might be worth a search over there. I find this line to have some wonderful scents, and I have been tempted, but never have made a purchase at those prices. So far, there has not been one I’ve thought worth the price — but never say never! I have a circa 2008/2009 50ml Noir de Noir that has definitely changed, for the worse, the opening now smells completely rancid. A few weeks back I threw out a decant from the same bottle, and late last week discovered that my beloved full bottle has succumbed as well. I keep it in a medicine cabinet so it is never exposed to light. The only good thing to mention is that after 10 minutes it settles down and doesn’t seem any worse for the wear, but I did truly love the opening, which of course is now ruined. What is weird is that I now get more of a Black Orchid vibe from it, and while I respect that fragrance, I cannot wear it and don’t admire it. This is sad from such an expensive luxury brand. I have 3 other TF fragrances, but not from the PB line (White Patchouli, Extreme, Grey Vetiver), that all seem just fine. To me, Noir de Noir always smelled like a better worked out version of Black Orchid. It’s the chocolate aspect, I suspect. Recently, quite a few people here mentioned that fragrance sometimes oxidises in the atomiser tube but the stuff in the bottle is still fine so it might be worth spraying it a few times to get rid of the juice in the tube and see is the rest might be okay. I think I applied 4 or 5 sprays, that seems like enough to clear the tube, but I will try it again soon, thanks! Try 20-30 sprays, spray into a glass vial if you don’t want to lose the juice. If your decant turned, maybe it IS the bottle and not just the tube. I think Estee Lauder-type frags, which include the TF lines, have a propensity for turning. Anyway, sad to hear about it – at least your other ones are still okay. I do not think you can make any assumptions about shelf life based on the price of the perfume, unfortunately. There are some ingredients that just don’t last, and the industry typically only promises that a fragrance will last a year or so before needing to be replaced. OMG, I have over 100 bottles of fragrance now. I keep saying to myself, “enough, enough”, but then I sample something and fall in love with it. If I had 1 fragrance only I wonder if I could get all the way through a 100ml bottle in 1 year. I hear you. I have lost lots of bottles. If it’s incredibly important, buy a wine refrigerator — but I just live with the occasional loss. Robin, I assume the 1 year shelf life clock starts once it’s opened. Otherwise, buying new bottles may be risky since one never knows how long a particular bottle has been sitting in a retail store. Well, it’s meaningless anyway — we all know that some bottles last far longer than that, right? And yes, the bottle you buy could easily be quite “aged” already, and I do know that they age whether they’re opened or not, although at least they won’t be exposed to light. Best thing is to keep your house cold! My house just isn’t cold enough. There are several TF Private Collection fragrances I really like, but I’ve never had the need for a FB. Maybe Santal Blush, maybe Jasmin Rouge … together they could be the most expensive reinterpretation of Samsara ever. But I look forward to trying these, I typically don’t like TF florals b/c they are VERY opaque but lately with Yann Vasnier on board they have lightened up considerably and are SO much better for it. Guess I should ask, who is credited for these? Don’t know, but will update if I find out. TF does not go out of his way to credit perfumers. That’s true. I think maybe the Yann Vasnier thing was a big deal b/c he has such a strong reputation. Anyway, Santal Blush is amazing, diffusive, and not at all what I would have expected from a TF PC wood. They are very expensive and I usually avoid even when I like the scent. I did break down a few years ago and buy my husband Tobacco Vanilla. Mostly to get him away from Drakkor Noir!! God, I hated it since we dated. He liked the TF at first but then changed his mind, he thought too sweet. So I took it over and now it’s a favorite winter frag. (He goes scent free) I like the idea of Lys Fume, but not at those prices! These sound awesome! No way I could afford them, but would love to get a decant! Any idea if they’ll be (or are) available anywhere besides Saks? Yes, I know they are coming to other Private Blend counters. Mrs. Scents, I’ve also seen ’em at Neiman Marcus. Select Nordstrom’s also carry the Private Blend line. 0.0 at NM right now? These have been on sale for the last 6 weeks in the UK and i was excited by the tought of them, but the reality was a big disappointment. The Lys & Jonquille are very non-descript and short lived. The hyacinth i actually enjoyed but not at this price. The one i was looking forward too most was the Cafe Rose, as i liked the idea of coffee and rose but the reality smells more like something from the By Kilian Arabian Nights collection – Rose Oude/Incense Oud – where did the coffee go ?!? Id consider paying £50 for them on eBay but definitiely not at this price. It disappoints me to say it but i think this is another white elephant mini-collection from Mr Ford, rather like his White musk collection. It’s my birthday tomorrow and I’m thinking a splurge on one of these might be a good way to start my collection. I sniffed these when I was at Saks during Elements. They are all interesting takes on floral. Three of them are way too femme for my tastes (and I ma not afraid of rocking HdP Vamp A NY) – but Cafe Noir is something special. I am going to wear it a few times but I am afraid that my Fordie obsession (have 13 PBs in my drobe) will take over. these sound terribly exciting!!! i haven’t been this excited to smell something in a while. So I guess I’m the only one who finds the notion of 250 mL of fragrance sort of ridiculous? If I’m a perfumista, I want smaller bottles so I can have MANY scents; if I’m NOT a perfumista, I probably don’t want to wear it every single day, every occasion. I know, I know, there’s the signature scent folks out there, and maybe they want to bathe in it–but really? Are they that much more of a market than the 15mL perfumista crowd (who’s going under-served)? I am with you though – I would love to get 30 ML of a lot of fragrances. Then again – we parfumistas are not the target market of the mass lines. Perfumistas are nobody in the mainstreams target market. We simply don’t buy enough. I don’t know French, so as far as I can tell from online translation, Lys Fume would be smoked lilly? Which sounds rather intriguing to my jaded nose, but the description above doesn’t say anything about smoke, so I wonder. Nozknoz, I think that “fume” (without an accent on the e) is the noun and the closer meaning is emanations or vapors. So Lily Emanations may be closer. That sounds more rational, Lindaloo! Is there a law that you can’t launch a fragrance in 2012 unless it has “noir” in the name?